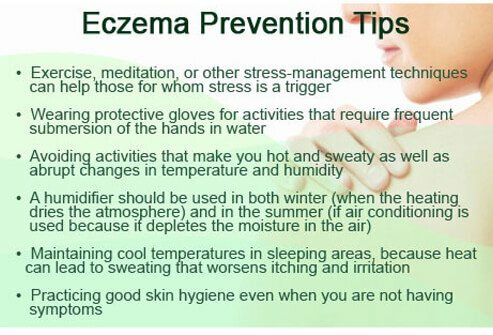 Eczema is a descriptive term for a chronic skin condition that usually begins in early childhood. It is seen most commonly in individuals who have family members who have asthma and hay fever. 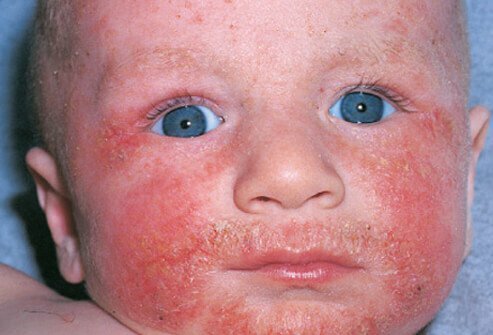 This is not to say that eczema is a classical allergic disease. There seems to be general agreement that this condition is inherited because of the complete loss or relative lack of a skin protein. 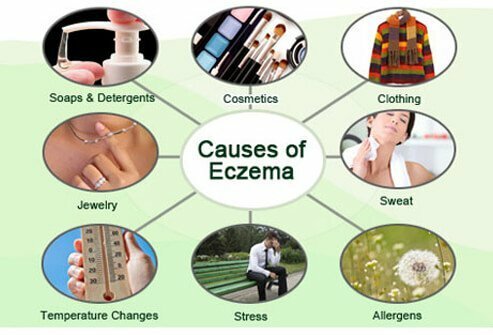 There are criteria that must be met before the diagnosis of eczema is considered. In most patients, the condition began in childhood. Patients develop plaques of weeping, oozing skin that are very itchy. A personal or family history of eczema, asthma, and/or inhalant allergies is helpful. 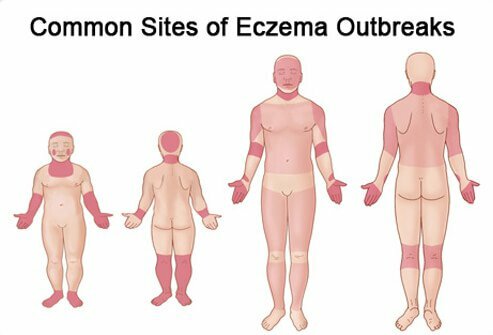 In older children or adults, the lesions of eczema tend to occur in the folds of the skin in front of the elbows and in the folds of skin behind the knees. 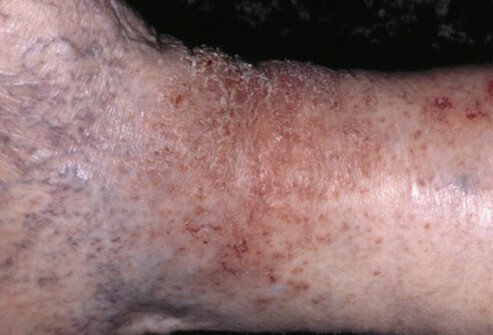 Eczema tends to improve in most patients as they get older. 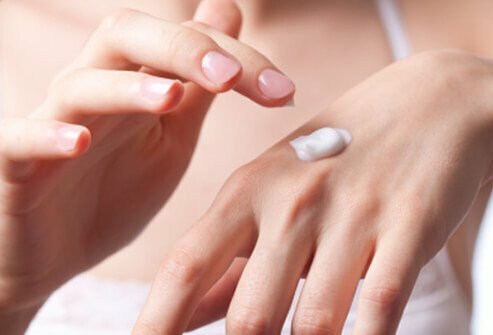 The belief that the cause of eczema seems to be a defect in the production of a particular skin protein (filaggrin) is currently quite popular. All of the other problems that seem to be present in those afflicted include dry skin, hyper-reactivity to wool, itching during sweating, colonization by pathogenic staph bacteria, predisposition to disseminated herpes simplex infections, and a variety of immunologic abnormalities. There is a debate about which comes first in atopic eczema, the itching or the rash. This is analogous to the chicken and egg controversy. It really does not matter. When the rash is in an acute stage, it is weepy and oozy. Later after the patient has been rubbing and scratching for some weeks, it becomes a plaque of thickened skin. This is called lichenification. Atopic eczema has a typical distribution on the surface of the skin; this can be quite helpful in making the correct diagnosis. In crawling children in diapers, the rash is frequently seen on the elbows and knees but spares the diaper area. In older children and adults, the rash is often present in the folds of skin opposite to the elbow and kneecap but spares the armpits. Other areas commonly involved include the cheeks, neck, wrists, and ankles. 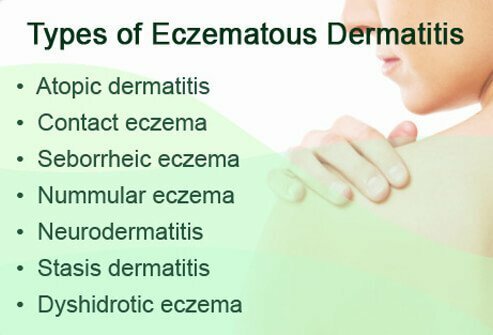 Atopic eczema (atopic dermatitis) is one of a number of eczematous eruptions that need to be distinguished. This is important because treatment depends on the correct diagnosis. We'll take a look at the listed types on the following slides. 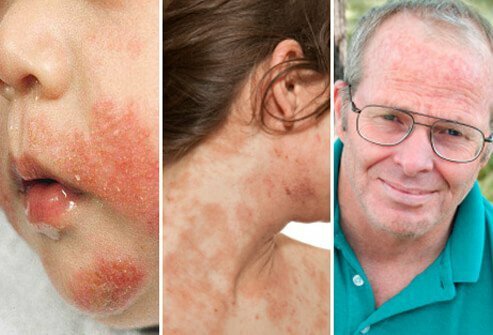 Atopic eczema is an inherited skin condition more common in individuals with a personal or family history of eczema, inhalant allergies like asthma or hay fever. Patients develop weeping, oozing, itchy lesions in a characteristic distribution. The severity depends to a great extent on the amount of moisture in the skin. Atopic eczema is less common in very humid environments and is harder to control in arid areas in the wintertime. It often begins in infancy and improves in most people as they reach adulthood. Contact dermatitis is a dermatitis that occurs in response to exposure to an irritant or allergenic substance. Irritants cause skin damage by producing direct toxic damage to the skin cells. Contact allergens are not necessarily irritating or toxic but are recognized by the immune system. Once the immune response is stimulated, a dermatitis occurs at the site of exposure. 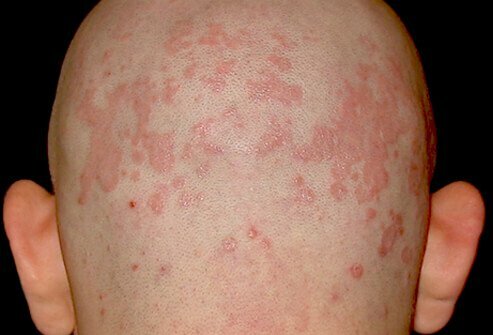 Seborrheic dermatitis is a chronic recurrent dermatitis, and it is probably the most common of all rashes in adults. 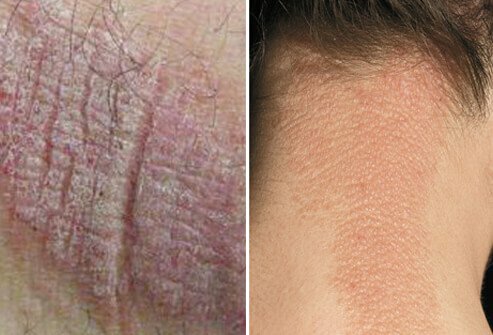 The rash characteristically appears on the scalp, forehead, brows, ears, the folds that extend from the nose to the lips (nasolabial folds), middle of the chest, and middle of the back. It occurs in infants as cradle cap. Its course is distinguished by periods of improvement followed by flares. 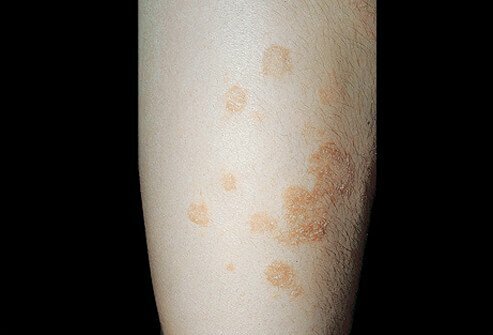 With nummular eczema, round plaques of eczematous skin often appear on the lower legs. It often is seen in the elderly and seems to be associated with dry skin. 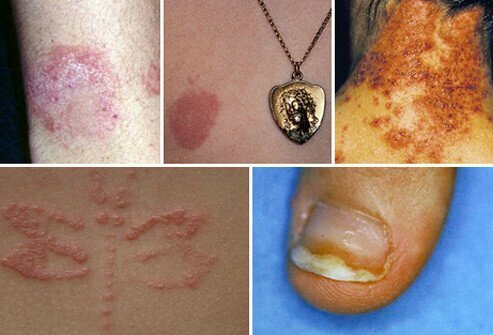 Lichen simplex chronicus is a localized, thickened area of skin caused by itching and rubbing. Although there is usually some inciting cause, the origin of the problem is entirely obscured by the eruption. Any of the eczematous eruptions can evolve into lichen simplex chronicus if rubbed long enough. Stasis dermatitis usually occurs on the lower legs of patients who have sustained damage to the valves present in the large veins responsible for returning blood to the heart. These valves, along with muscular contractions of the leg muscles, help propel venous blood from the periphery to the lungs and heart. Damage to these valves causes a long column of blood to produce enough hydrostatic pressure on the wall of the vein so small leaks occur. The lower legs swell and brownish blood pigment is deposited in the skin from degradation of hemoglobin. A dermatitis often occurs, and skin ulcers are common. 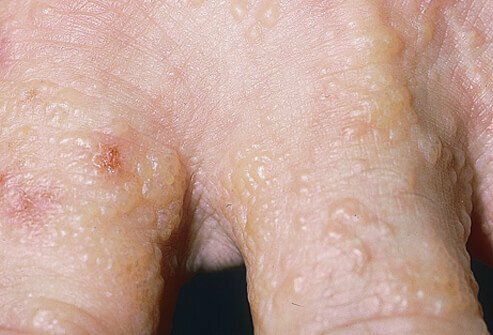 Dyshidrotic eczema (pompholyx) is a common but poorly understood condition in which very itchy small blisters occur on the lateral surface of the fingers, toes, hands, and feet. Many patients note exacerbations during periods of high stress (for example, finals week). In order to make an accurate diagnosis of eczema, it is important for your physician to take a complete history and examine all of the areas of skin that are affected. Occasionally, certain laboratory tests can be helpful in distinguishing various types of eczema. A pathologist may need to examine skin scrapings and even a small piece of biopsied skin. Once the diagnosis of atopic eczema is established, there are certain well-established approaches to treating this condition. One of the most important is to keep the skin well moisturized. There are many inexpensive approaches to maintaining the moisture content of the skin. Once the skin is wet, a thin layer of a cream or ointment is applied to prevent the moisture from evaporating. Judicious use of such substances (emollients) can be very effective in limiting flares of atopic eczema. Corticosteroid creams are very effective at controlling the inflammatory component of atopic eczema. The thickened, itchy, weepy lesions respond well to the applications of such creams. In addition, oral antihistamines are effective in suppressing the itching sensation as well as acting as a sleep aid during flares. 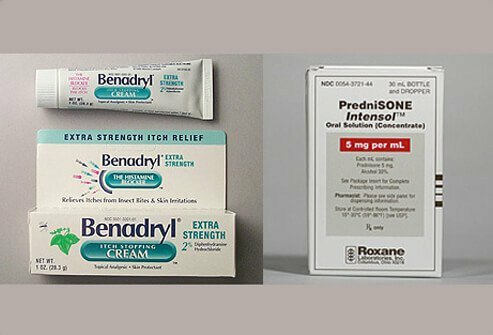 Newer drugs have become available for the treatment of atopic eczema; they claim to be devoid of the side effects of topical steroids. These newer medications inhibit the immune response by inhibiting calcineurin, an enzyme necessary for a normal inflammatory response. Though they are quite effective, they are also quite expensive and seem to lack potency when compared to the strongest topical steroids. Ultraviolet light exposure can effectively control eczema in certain patients because of its effect on inflammatory cells in the skin. Applying a good moisturizer to damp skin is the most effective method for limiting flares of atopic eczema. 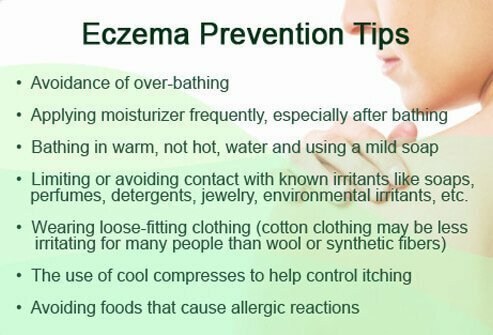 Try the measures listed on this and the following slide to control and help prevent outbreaks of eczema. 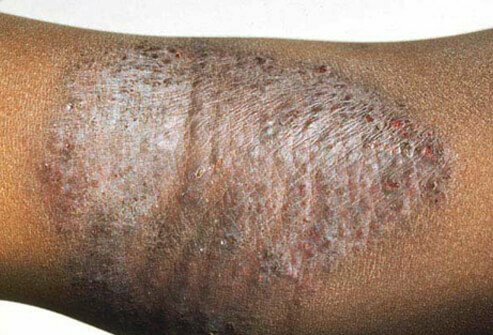 Can Eczema Be Prevented (continued)? Since the condition is inherited, it would be very difficult to prevent its development entirely. Living in a warm, humid environment seems to limit flares of atopic dermatitis. Sleeping with a humidifier in the bedroom can be of some help. In some patients, adding chlorine bleach to bathwater can be quite helpful (1/2 cup of bleach to a bathtub of warm water). It is important to rinse off before applying an emollient. Asian Pacific Journal of Allergy and Immunology: "Moisturizers for Patients With Atopic Dermatitis"